Today when Lara, Barney, Ollie and I returned from a long hike at San Dieguito County Park, we heard cooing as we approached our van which was parked at the lower level entrance on El Camino Real. I looked up to see a brilliant white hen and tom turkey standing on the far side of the road. I saw a couple of people trying to block them from crossing the busy thoroughfare, so decided to lend a hand. One of the Good Samaritans was Karen Carhart, a volunteer with the San Diego Humane Society, Large Animal Rescue. She called Leslie Buncher, a fellow volunteer who arrived with a cage. A passerby said she had a dog kennel we could use to house the tom temporarily. It went very smoothly with minimal stress to the birds. Leslie explained that he was transferring the couple to the humane society with the hope that their owner would claim them. If they don't, he assured us that both birds would be adopted out together since they were obviously mates, and pets. It was a great outcome. You can view a video of the birds on my other blog, Lillian's North County Notes. Wow, talk about being in the right place at the right time! I didn't know you could approach birds like that. 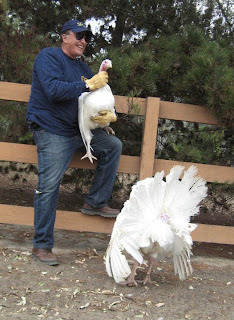 two weeks ago i received call from farm sanctuary about turkey chicks in northern california that needed a home. i told the placement coordinator i could take two. 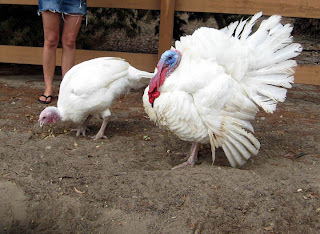 i work with karen carhart, i mentioned to her that i was adopting two turkey babies, she told me of the two she helped rescue, showed me pictures. the very next day farm sanc called to ask if i could take two adults, of course i said yes. they were the same pair that was placed at the north county shelter. claude and gina (as i have come to call them) came home with me yesterday. they appear to be happy. not to be petty about details but, the rescue group from the SD humane society is Animal Rescue Reserve, which rescue small medium large ect. 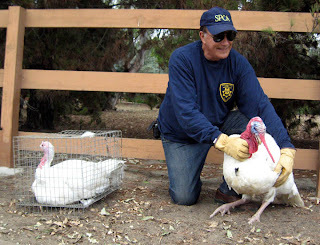 Also, the turkeys ended up at Dept of Animals services, because they were strays. They first went to stay the night with Leslie Buncher's brother Martin in RSF , DAS picked them up following morning. 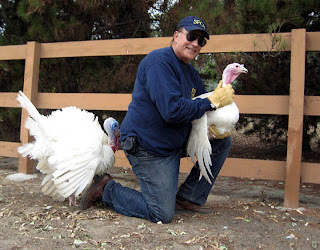 I want to say thank you to all who were involved helping these turkeys. We rock!!! gina and claude are doing very well. gina is laying eggs, claude likes having his head rubbed. they are very nice pets.